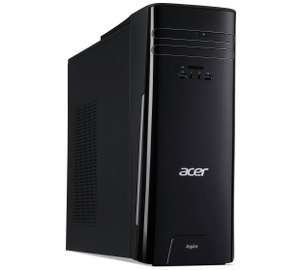 Driven by a powerful Intel Core i3 processor and 8GB of RAM, the Aspire TC 780 desktop provides superior performance, where demanding tasks like editing home videos are easy. You get the option of expandability, a massive 2TB hard drive for all your documents and media, while the elegant black housing offers front-panel media access. A massive 2tb hard drive gives you storage space for up to 550,000 digital photos, 500,000 mp3s, 880 hours of DVD quality video or 240 hours of HD video. Intel Core i3 dual core.7100.Processor speed 3.9GHz.8GB RAM. Shared graphics.Intel® HD graphics 630 with . 4 x USB 2.0 ports.3 x USB 3.0 ports.2 HDMI ports.Bluetooth.Wireless/Wi-Fi enabled.